than 200 inches of snow each season. LEGEND HAS IT THAT LONG AGO, Moache Utes were saved from a disastrous lightning fire when shifting winds blew in a squelching rainstorm. They began calling the 11,060-foot peak “Breath of the Spirits,” a name incoming Franciscans Christianized into “Angel Fire.” Today Angel Fire Resort bustles with families buckling into ski boots and looping tethers around tots for their first time on the slopes. The resort marks its 50th anniversary this season, with a celebration January 17–21. The birthday party includes a vintage ski day, cocktail party, reunion dinner for past patrollers, and an après-ski shindig with fireworks. It’s a far cry from the start-up scene when the LeBus family of Wichita Falls, Texas, turned their pastureland into the Angel Fire Resort. The family had run cattle since the 1950s on the same land that legendary rancher and entrepreneur Lucien B. Maxwell once did, but a formative trip to Vail, Colorado, inspired them to create a ski resort set in the Moreno Valley, which traces the eastern arc of the 84-mile Enchanted Circle Scenic Byway. Now it’s in the hands of the Allen family, also of Texas. The town’s main drag borders the resort, a rambling stretch of ski shops and restaurants. The resort and the town itself have a Lone Star State vibe—and not just because Texans make up more than half of the second-home owners here. Both exude warm hospitality to visitors, from snowsuit-clad toddlers to snowboarding seniors. Here’s what gives Angel Fire its gleam this golden ski season. 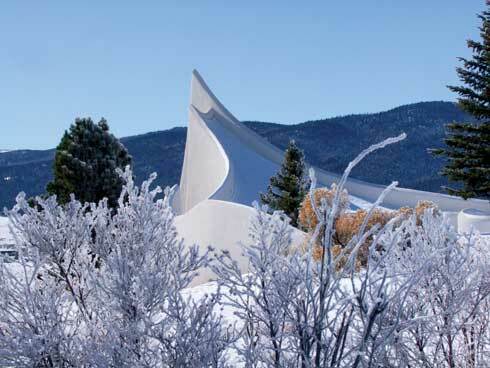 An average of 210 inches of snow blankets Angel Fire each winter, priming the town for much more than downhill. On the Polar Coaster, a three-lane tubing hill, an inflatable bag safely stops the thrill ride. If your kids aren’t tall enough (they have to be at least 42 inches for tubing), head to the golf course, where smaller hills and plastic discs add up to an afternoon of tamer fun. Come first snowfall, the golf course’s gently rolling hills transform into 15 kilometers of groomed terrain for cross-country skiing. The course may be one of Angel Fire Resort’s best-kept secrets. The resort offers rentals and lessons, during which you can perfect your glide on a circle track by the country club before setting out on five sunlit trails. Give your kids’ skills a head start at the ski school, which accepts children as young as three—the youngest in the state. There’s also a day-care facility on the ski hill, but if you want to trade off duties with your partner, opt for the Parenting Pass. Starting at $73 a day, this interchangeable pass allows you and your partner to alternate skiing and caring for a child too young to ski. If you want to buff up your own skills, the ski school has a four-to-one student-to-instructor ratio, small enough that even during group lessons you’ll get specialized instruction. 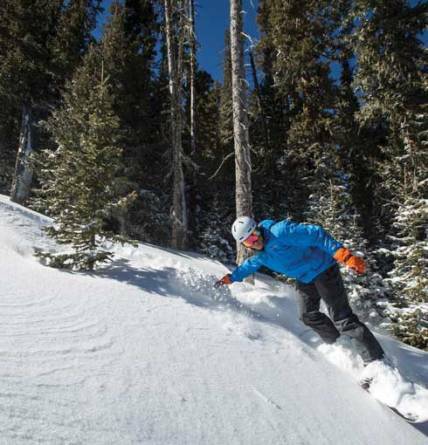 Angel Fire Resort debuted its third terrain park, Liberation, last season, and the park became the first in the state with dedicated lift access. Jon Eppler designed the playground full of jumps, rails, and boxes for skiers and snowboarders, with dedicated lines for those with beginner, intermediate, and advanced skills. Eppler, who spent his teen years in Angel Fire and now works as slope operations manager at the resort, is one of the most prolific terrain-park designers in the country, with ESPN X-Games bona fides. He also installed “stash parks” all over the mountain, sprinkling blue and green runs with natural snow berms or logs. Don’t unbuckle your boots at sunset. Just wait for the floodlights and you can continue your runs on the lower part of the mountain—the only night skiing in the state. The bright lights shine on the front side of the mountain from 4 to 8 p.m. on weekends and holidays, giving you 50 acres of groomed trails, as well as the Night Rider terrain park. Some, possibly those itching for a fight, describe Angel Fire as the poor man’s Aspen, but it is perhaps better described as the smart buyer’s Aspen. In winter 2015–16, Realtor.com called Angel Fire one of the most affordable resorts for families and second-home buyers. And it’s a good choice for renters, too. In 2015, TripAdvisor.com rated the town 12th on its list of “29 Super Affordable Vacation Rental Destinations You Need to Visit.” The resort includes condos and freestanding homes with additional real estate available outside the resort. Vietnam Verterans Memorial includes the Peace and Brotherhood Chapel. —After her winter getaway in Angel Fire, Albuquerque-based contributor Ashley M. Biggers can’t wait for a summer weekend trip for ziplining and mountain biking there.